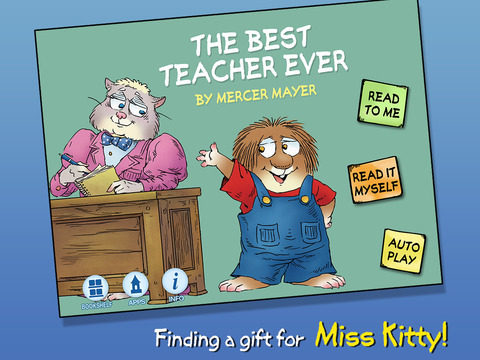 The Best Teacher Ever by Mercer Mayer is one of the new adventure with Little Critter, published in print in 2008. In this title, Little Critter tells readers about his favorite teacher, Miss Kitty and all the wonderful things she does for her students each day (which thankfully includes not playing 'cat & mouse' her rodent pupils). The digital version of this book also adds a new twist, keeping track as the young reader tries to find 15 of the little mice and 16 of the spiders, hidden on nearly every page. The delightful child narrator is easy to understand and a perfect fit, since the story is told in the first-person by Little Critter. Featuring all the activities typical in a school day (classroom antics, field trips, and more), this title will enchant young and old alike. Join Little Critter in this interactive book app as he searches for the perfect gift to show his teacher Miss Kitty just how special she is to him! Explore pictures, learn new vocabulary, and personalize the story with your own narration. Jump inside to find out why Little Critter has the best teacher around!